I have become somewhat disillusioned by the world of modern football. I am referring to the announcement that Mario Götze is to leave Borussia Dortmund this summer and join Bundesliga rivals Bayern Munich. The move by Munich to trigger Götze’s minimum fee release clause of €37m will make him the most expensive German footballer ever. I am however really trying to find a logical reason for Götze to want to leave Dortmund, that isn’t motivated my money. I can’t find one, and this has started to trouble me. I’m not going to pretend this is the first time I have seen a footballer move clubs solely for the purpose of money – that would be naive – but this one feels a bit different to the others. Götze’s Dortmund team, praised across Europe for their attacking style of play, and team spirit, won the Bundesliga back to back before Bayern dominated it this season. Under the stewardship of tactician Klopp, the young team have easily finished second and reached the Semi Finals of the Champions League. The German club are regarded by many as one of the best teams in Europe. Money aside, why would a footballer would want to move to the club that has dominated the league in recent history, when his team are starting to show a real sustained challenge to that dominance? Klopp told the press that Götze wanted to work under Guardiola, and joked that ‘I cannot make myself 15cm smaller and learn Spanish’. Is this really the sole reason for Götze wanting the transfer, especially because he has never working under Guardiola before? After all, it was Klopp who really ignited his career as one of the brightest talents in Europe. In search of reasons for Götze move, I turned to social media, and to German football fans; Is Mario Götze known to be a childhood Bayern Munich fan? There was a mixed response, with the German press seemingly unsure itself. Holding a slither of hope that this young player hasn’t been motivated solely by money, I point to another young player that wasn’t. Last summer, Champions League finalists Bayern were quoted as saying that they could sign any player they wanted, because of the stature of their club; the statement was motivated by their interest in exciting talent Marco Reus, who had signaled his impending exit from Borussia Monchegladbach. 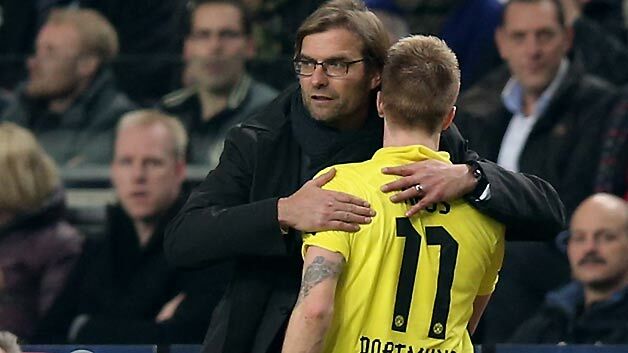 Later in the summer, Reus signed for Dortmund, citing his desire to play every week and work with coach Klopp; his performances have hardly disappointed for Dortmund this year. Not motivated by the highest salary on offer, nor wanting to sitting on the bench at the monopoly power in the league, Reus is what the game is all about. Though he hasn’t won any silverware with Dortmund – yet – it’s unlikely he regrets his decision to join them last summer. After all, second place and a Champions League Semi Final isn’t bad going either. 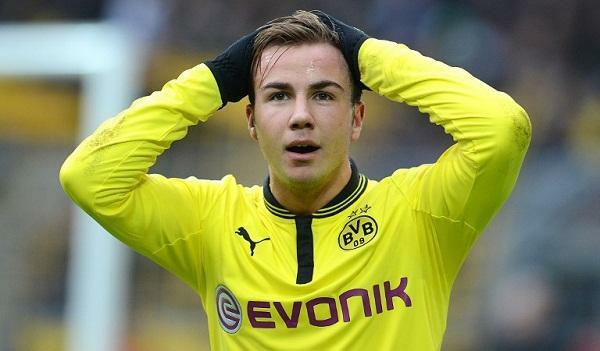 If Götze really is a Bayern fan, and if he is achieving a lifetime goal by playing for them, bear in mind he has been at Dortmund since the age of nine. If he has moved for a paycheck, he’ll lose some of the respect he’s garnered in his short career – it’s hardly as if he was struggling to earn a wage or gain success at Dortmund. Either way, I can’t help but feel that at a time when the Bundesliga was finally getting more interest around the world, with high goals per game ratio, the emergence of talents such as Götze and Reus, coupled with European progress, it has just been dealt a competitive domestic blow. This season Dortmund were never really title contenders, with Bayern unstoppable all year, but the team from Ruhr valley were always wanting to come back swinging next season. Without Götze this will be a much harder task. With Guardiola already house hunting in Bavaria, Bayern were always likely to invest heavily and be favourites for the league next season, but the transfer of Götze hasn’t only made Bayern better, it has pushed Dortmund further back. The gap between the two is now only likely to stretch. In the short term, Dortmund fans are furious – not only for Götze leaving to join their bitter rivals, but for the announcement a day before their European clash with Real Madrid, the biggest game in the club’s recent history. The money from the transfer will need to be invested wisely by Klopp, if his young guns are to have any chance of winning back their league crown next season. In reality though, the Bundesliga has already rubber stamped Bayern as champions for the next few seasons, and there won’t really be a title ‘race’ at all. Dortmund have replaced the departures of Nuri Sahin and Shinji Kagawa in recent seasons, but Götze was the poster boy that they aimed to build a dynasty around. I hope for the sake of the game and the Bundesliga that Götze’s move is motivated for the right reasons because it’s detrimental to the league as a whole. For something such as that to be motivated by money, and not passion for the sport, is a problem in the modern game. This entry was posted in Analysis and opinion and tagged bayern munich, borussia dortmund, bundesliga, jurgen klopp, marco reus, mario gotze, pep guardiola by Paddy Spicer Ward. Bookmark the permalink. Growing up in Liverpool, as any other Scouser will tell you, readies you for a life surrounded by football, and my childhood was no different. Hailing from the ‘Red’ side of Merseyside, I study International Development at University of Leeds, but am currently living in Ankara, Turkey, on my year abroad. I spend a lot of time losing accumulators and playing Football Manager. I’m the bloke you see in early September peeling after a summer of constant sunburn. I also have soft spots for Genclerbirligi and Celtic, the latter thanks to my Glaswegian uncle and his Celtic Supporters club in Liverpool. The former you are likely to have never heard of, but are my local team in Ankara, check them out. Egg chasing I support Salford Reds and Lancashire in the gentlemen’s game. I sort of speak Turkish. Teşekkürler.